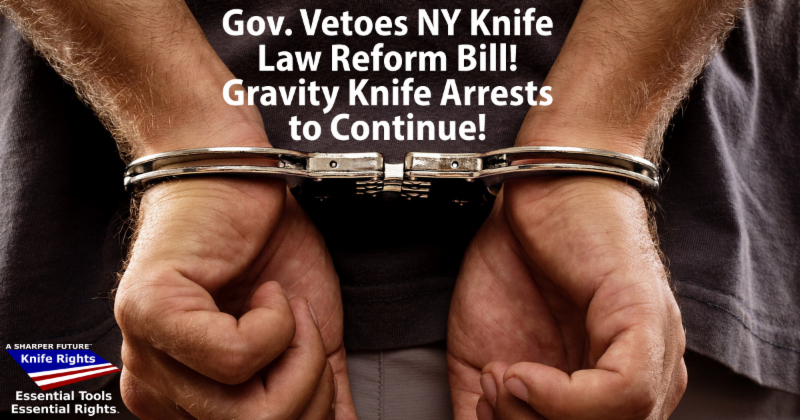 New York Governor Andrew Cuomo has AGAIN vetoed Knife Rights’ Gravity Knife Reform Bill, once again effectively giving the finger to New York’s legislature that overwhelmingly passed the bill that specifically addressed Cuomo’s concerns with last year’s bill. The bill passed in the Assembly 128-1 and in the senate 61-1. Despite valiant last-minute efforts by bill sponsor Assemblyman Dan Quart to come up with a workable compromise, the Governor simply would not sign a clean bill. Cuomo once again turned his back on the large coalition of organizations, many part of his own constituency, which supported the bill. Despite the thousands who called and emailed the Governor to sign the bill, and thanks very much for those who did so, he again sided with the disingenuous arguments made by New York City Mayor Bill de Blasio, NYPD Commissioner James O’Neill and District Attorney Cyrus Vance, Jr., virtually the only ones who opposed the bill. In vetoing this bill he has once again doomed thousands more to arrest and prosecution for carrying common pocket knives that won’t get someone arrested virtually anywhere except in New York City. This second veto clearly reveals the lie of Cuomo’s avowed commitment to criminal justice reform in New York. Knife Rights will continue to work on a legislative fix that protects knife owners, retailers and manufacturers. Meanwhile, Knife Rights’ federal civil rights lawsuit that is currently on appeal before the U.S. Court of Appeals for the Second Circuit is fully briefed and will continue. That lawsuit contends that New York’s unique “wrist flick” test used to determine if a knife is an illegal gravity knife is unconstitutionally vague. The battle is not over in New York and we will continue this fight in court and the legislature until this absurd enforcement by New York City is fixed and innocent, law-abiding people can carry a common pocket knife on the streets of New York City without worrying about getting harassed by the NYPD.